When was the last time you tried to do a search for information on our haunted library online? Because most of you can visit the Sweetwater County Library, you may not have tried. Several patrons have reported multiple online links about the many ghost stories at the library. So I decide to check it out. I had no idea there were so many online sources mentioning our little library. Who knew? I began by doing a simple search on the search engine Ask.com. Here are the links I found. Hearing the story of the Sweetwater County Library will teach you a very important lesson. Never mess with graveyards or you will disrupt the spirits that linger there. The Sweetwater County Library is without a doubt the scariest place in Wyoming. The library opened in 1980 and shortly after the opening, problems started to occur. Appliances and lights started to go on and off randomly and books flew off the shelves at night. It was almost immediately that these experiences started to occur. A few years’ later people started hearing strange voices and flapping noises throughout the library. That was when the people in the city realized that their local library was haunted. If that wasn’t scary enough, soon balls of light were seen wandering around the halls. The people who witnessed these balls of light believe them to be supernatural orbs. Typewriters started typing on their own and gates began swinging uncontrollably. There was never any reason or rhyme for these things happening. Nothing could explain why these things were happening. Sometimes the recorder in the library would record on its own. It would record the air and sometimes clicks and loud breathing would be heard on the recording. This was where people working at the library drew the line. They desperately wanted to know why this was happening to their library. After extensive research, they found that the library was built directly on top of a cemetery from the 1800s. Supposedly graves were moves in the early 1920s, but bodies kept turning up. They thought they had moved all the graves, but there were always more bodies found. A slew of bodies were found in the 1940s and again in the 1980s and it’s likely that there are still bodies underneath the library today. This serves as a great lesson about not disturbing cemeteries. Do not build on top of a cemetery or you are sure to hear from the spirits who are upset that you disturbed their peace. 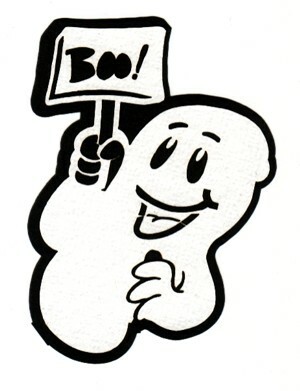 And, of course, have you ever had a ghostly encounter? KW: I have had a few occasions in the past where I thought I might have seen a ghost, but nothing definite. However, I recently went on a ghost walk at the Sweetwater County Library in town and at the end of the tour, as the librarian told us how the area used to be a playground before it was a library, we heard the sound of children’s laughter resonating from the dark, abandoned hallway behind us. It was very real, loud enough to startle us, and several people heard it, including me. It was pretty cool, actually! 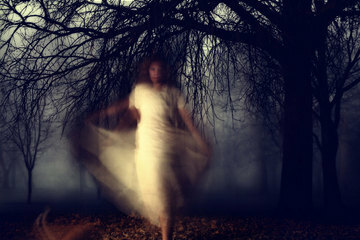 You can read more about my experience on the ghost walk on my website http://authorkw.wordpress.com/. I hope you enjoy all the posts. As I wrote this I was surprised to see the article about the “angry spirits”. I have worked for the library for 23 years and have never found that to be the case. Our spirits here, seem to be just that “here”. We have only had a couple people ever state they felt anything other than friendly and it was more the spirit was angry about something in the past, not at us. I look forward to your comments about the many sites listed. Many of these involved unexplained electrical disturbances. Women staff members on several occasions reported turning off the lights in the Multi-Purpose Room, only to find them on again ten minutes later, with the switch controlling them still in the “off”position. Maintenance men Marlin Dillard and Don Leasor experienced similar disturbances in the same room and on the stairwell, and each time they could determine only that nothing was causing a short. Ed Johnson was no more successful in finding the cause of mysterious behavior in a vacuum cleaner. “One night after the library had closed, I was running the sweeper back and forth between the book stacks,” he said. “Once I moved too far and pulled the plug out of the wall. Naturally, the vacuum quit working, so I turned the switch off and went back down the stacks to plug in the fifty-foot cord. But before I had walked back to turn the switch on again, the vacuum started by itself! Nearly everyone I interviewed reported the same sensation of being watched, especially in the Multi-Purpose Room. A custodian was vacuming there one day when she happened to glance up at an adjoining stage. The curtains were open and the stage was set for some upcoming events. The woman thought to herself how nice it looked and went back to her sweeping. When she glanced up again a short while later, the drapes were closed. Because they were operated by an electric opening and closing mechanism, the woman reasoned that one of the control switches must be at the Circulation Desk, and that the staff there were playing tricks on her. Upon confronting them, however, she discovered that the only switch for the curtains was the one in the Multi-Purpose Room itself. Don has probably experience more unnerving icident’s that anyone else. Several times since he began working in April 1986 he has seem mysterious glowing lights inside the building. Even more upsetting was the experience shared by Don and former custodian Marlin Dillard. “We were upstairs, in a different part of the library, but we could hear distinctly what sounded like somebody latching the doors to the Multi-Purpose Room,” said Marlin. “Then, when we went down to look, nobody else was anywhere in the building.” Strangest of all was the fact that the doors were not even pulled shut when the two men came to inspect them! Perhaps his scariest experience was hearing voices, however. “One night when I was carrying out the trash, I thought I heard people talking, “ He said. “So I set the trash outside and closed the door as if I’d already left. Apparently, whatever was in the building thought I had. But then I sneeaked back inside and heard the voices coming from the Multi-Purpose Room. It sounded like a man and a woman yelling and arguing, although the words were muffled so I couldn’t tell what they were saying. And since I had just come through that part of the library before taking out the trash, I knew no one was there. “I even checked to make sure that the noise wasn’t coming from outdoors,” Don said. “but finally, I gathered up my nerve and opened the door to that room. As soon as I did, the voices immediately stopped! Don Leasor was not the only staff member to hear the strange voices. A former maintenance assistant who was too terrified to be interviewed claimed that she often heard them when she worked alone from eight until ten at night. Since so many frightening things were taking place late in the evening, library director Helen Higby rearranged schedules and made it a rule that no one worked alone. Not long after the new policy took effect, the business manager came in to do some work on a holiday, and mindful of the new rule, she brought her Doberman pinscher along. “After she had been in the office for a while, “Helen said, “the dog suddenly went over to the door and cocked its head as if someone were outside. Then it came back and sat down in the middle of the room, but it continued to stare at the door, fully alert. That’s all that happened, but it gave everybody the creeps, because dogs, unlike people, don’t imagine things. “At one of the staff meetings,” Helen continued, “I told everyone, “Listen, I know how to deal with budget cuts; I know how to deal with all kinds of normal problems. But I don’t know how to deal with spooks!” So we talked about the possibility of getting an exorcist, about having a priest come and bless the building, but some of the emplyees didn’t want that. In their minds, that gave credence to something they didn’t want to think about. Apparently nothing out of the ordinary had been reported for a year or so at the time of my interviews in February 1988, but it is unknown whether the phenomena have stopped or are just not as noticeable now that workers are forbidden to be alone in the building. Skeptics might conclude that the new rule provides less opportunity for overactive imaginations to concoct spooky stories, but with so much evidence from so many people, it seems clear that something of an unusual nature was occurring. Even former librariian Grace Gasson, who attributes the disturbances to the building’s structural defects and the susceptible imaginations of the living, admits that she has no explanation for such things as the wildly oscillating security gate. Whatever caused the strange events at the library, most of the staff are less inclined to scoff at the supernatural these days. And even without the new rule, the odds are that you’d have a hard time finding anyone willing to spend the night there alone! To read more stories about haunted Wyoming, be sure to look for “Ghosts on the Range” by Debra D. Munn.